PHOTO ID is required to gain entry!! Welcome back to another Cohesion party. We’re delighted to welcome back Gonzalo aka Overdrive (Dacru Records) and look forward to a night of surprises. 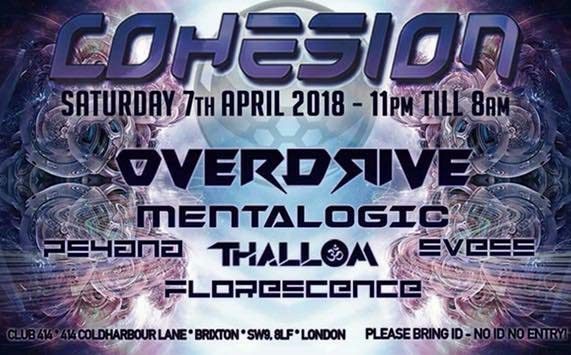 For the first time at Cohesion we have DJ Florescence who has recently become part of the Psy-Sisters: Svess & Psyana, who also join us. Our guests will be ably supported by Thallom & Mentalogic. Don’t miss out what will be another epic party. Open Roof terrace for those who wish to smoke – Please note that excessive noise will be not tolerated outdoors – Please respect the neighbourhood, – Thank you for your co-operation ? – London’s No.1 Psy Trance Clubbing Night Out!